For those interested in the broad situation of health and place globally, the World Health Organization’s Global Health Observatory is a useful resource. The observatory includes data repository, reports, and a useful map gallery. Maps, using data at the country scale, cover a wide range of topics from average cholesterol and avian influenza to health expenditure. These are clear maps at a similar scale and a terrific resource. The WHO Healthy Cities Program has been around since the mid-1980s and but is not as well known in the United States as it perhaps should be. 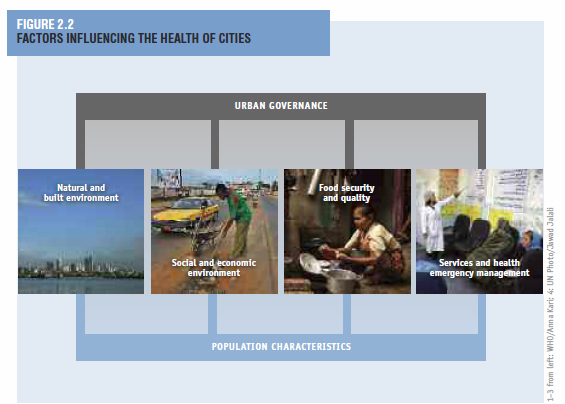 The program is focused on “health development through a process of political commitment, institutional change, capacity-building, partnership-based planning and innovative projects” (http://www.euro.who.int/en/what-we-do/health-topics/environment-and-health/urban-health/activities/healthy-cities). Healthy city activities typically focus on fostering collaborations and partnerships to promote health with a refreshing mix of interventions—policies, programs, and plans. Activities that won Healthy Cities Awards in recent years include schools that promote urban health, injury and violence prevention activities, best practices in public toilets, and healthy urban transportation (http://www.alliance-healthycities.com/htmls/awards/index_awards.html). The WHO European office has a useful healthy cities checklist that shows the wide range of topics of interest to the program from ecosystem health and public participation to diversity and economic vitality. You can read the whole list at http://www.euro.who.int/en/what-we-do/health-topics/environment-and-health/urban-health/activities/healthy-cities/who-european-healthy-cities-network/what-is-a-healthy-city/healthy-city-checklist. UN Habitat produces and distributes a large number of reports, many related to health with numerous publications on water infrastructure, social inclusion, disaster management, housing issues, and climate change. Although you can buy printed reports that isn’t always necessary as many can be found for free.